Bringing a pet to work provides many benefits for you, your special companion, and often your co-workers too! Animals have been our companions for thousands of years, working alongside us and keeping us safe. Our relationship has changed quite a bit from being primarily work and protection based, to that of a pet loving society. But interacting together and keeping our special companion close by is still highly valued. 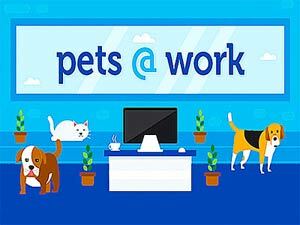 In fact, there is a dedicated “Take your pet to work” day celebrated every June and many employers are inviting pets into the workplace on a regular basis. Your special companion may be a dog, a cat, or even pet fish and a pet-friendly work place offers daily animal interactions first hand. You and your colleagues as well, are likely to experience many health and social benefits as pets bring joy and relieve stress. Pets at the workplace have been found to have a profound effect, helping employees be more creative, productive, and cordial to each other. However, this is a different type of workplace environment that comes with a new set of guidelines and etiquette. 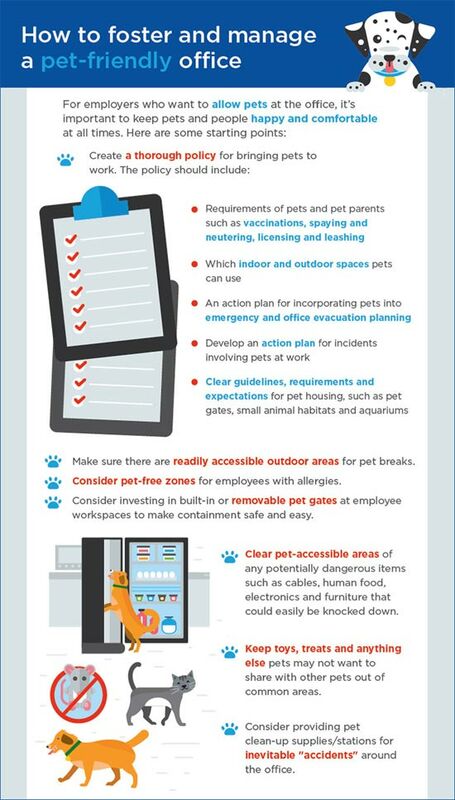 Whether you have a pet you want to take to work or an employer thinking about providing this opportunity, it’s important to understand how this can impact the work environment and do the necessary the preparation. 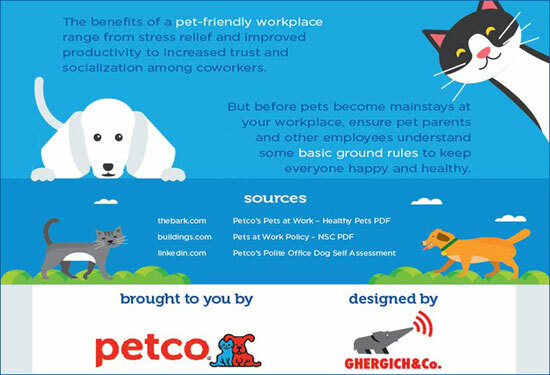 We were invited by PetCo to share their “How to foster and manage a pet-friendly office” chart with you, and it’s a great overveiw for both employers and employees. Foster and manage a pet friendly workplace. Make sure your pet is healthy and ready to spend a day at the workplace. Guidelines for you and your companion pets. Benefits and success resulting from good ground rules. Pets at work can make people happier, less stressed, and more productive. The chart is a good start for both employers and employees to make good choices and create the most enjoyable work environment with pets. Do you take your pet to work? Share you pet story by simply signing up on Pet Talk and join in!